"Beat the Press has the insider`s knowledge to put power into the hands of ordinary people and small businesses. Anyone who reads it will have what it takes to keep the media from being sloppy or unfair. I even learned a few tricks. If you`re living in a cave you won`t need this book. But everybody else who has ever read or watched news and wants to know what goes on behind the scenes? Buy the book." 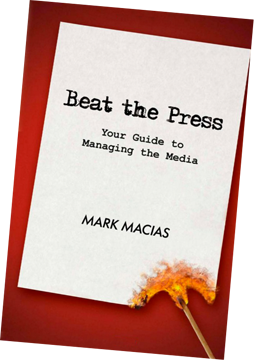 "Beat the Press is an astute and powerful insider`s guide on how to navigate the media world - a must read for all of those who want to get in the news, or want to stay out of it." "i`d hate to go against an adversary armed with Macias` insights. Beat the Press is an indispensable backstage pass to big media story selection and vetting. Anyone wishing to influence news coverage should own this book." "Beat the Press is an insider`s tool that will teach any business owner, politician, lawyer or publicity hound how to het in the news. This book unveils tactics and strategies that will help anyone shape his ir her message for the masses. Readers will also learn how to prep for the difficult interviews ans how to answer the tough questions. And should your story start turning negative, the lessons in this book will guide readers how to go on the offensive to protect your reputation. Don`t stress if you are a small business owner going up against a media giant. It is possible to influence the way your story is told."